Cercle d'Art Contemporain, Ring des Arts, Zurich, 1960, p. 102 (illustrated). Basel, Galerie Beyeler, Klee, June-April 1963, p. 84, no. 41 (illustrated in color, p. 35). Southampton, Southampton Art Gallery; Sheffield, Graves Art Gallery; and Manchester, Manchester Art Gallery, Sounds of Colour, 1982-1985, no. 18. A photo-certificated from Dr. Joseph Helfenstein of the Paul Klee Stiftung dated Bern, 10 October 1988 accompanies this watercolor which is recorded as "1931 Nr. 165 S5" in the artist's Oeuvre Catalogue. 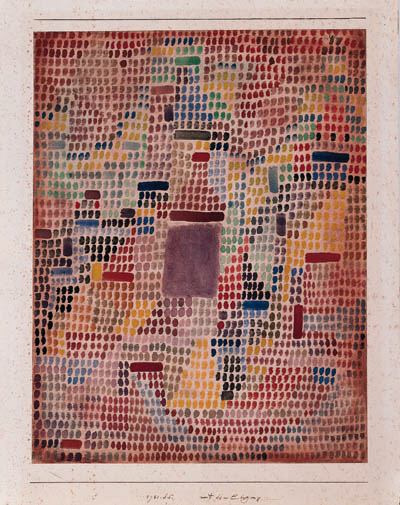 Following the example of Robert Delaunay's Orphist paintings, Klee often utilized color rectangle themes as an underlying structural device in his pictures. During the 1920s his goal became the development of "color polyphony", the simultaneous merging of flat color themes which create the illusion of depth, forming a visual expression of counterpoint, the layering of melodic lines in Baroque and Classical music. Klee realized that complex superimposition of color, no matter how deftly executed, would tend to a heavy opaqueness that would defeat the goal of transparent simultaneity. In the early 1930s a painterly solution revealed itself: divisionism, a kind of "color counter-pointillism." This idea occured to Klee as he became interested in the work of one of his Bauhaus students who excelled at mosaics. By breaking down his color forms into small component strokes of the brush, or indeed by miniaturizing the color rectangles he derived from Delaunay, Klee could compose forms that were open, light-filled and appeared to float before the viewer's eye. The composition itself is resolutely flat, a feature reinforced by the systematic application of the tiny color squares. At the same time, Klee achieves an ambiguous and mutating sense of depth as shapes emerge and recede among the tiny points of carefully modulated color. To carry the concept of polyphony even further, Klee would often apply linear elements to these compositions. His greatest work using this technique, the aptly titled Ad Parnassum, 1932 (coll. Kunstmuseum, Bern) is an artfully balanced synthesis of drawing and color divisionism. The present work does not mingle linearity and color to this extent, and indeed the purity and consistency of Klee's divisionist technique yields its own rewards. There is an insistent ambiguity that gives rise to a heightened sense of mystery. The title, "With the Entrance", refers to the large rectangular shape at the center of the picture, which anchors the composition and lends a point of reference to the eye as it explores the surrounding floating shapes.